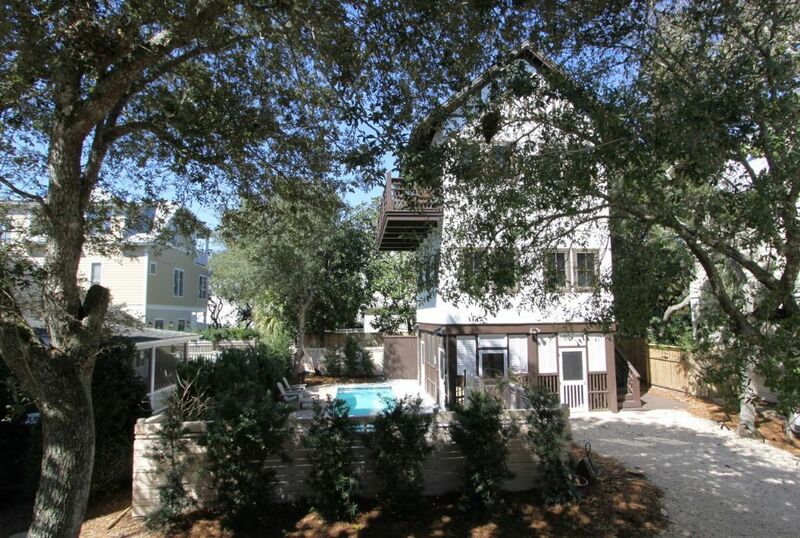 This three-story 800 sq ft carriage house in the quaint first section of Old Seagrove Beach is perfect for two days or two weeks. Nestled amongst magnolias and palms, “2 Days at the Beach” is barely 75 paces across the street from the beach, and is an easy stroll to Seaside’s shops and restaurants. Among the amenities are: an 8' x 30' private heated pool (heating fees apply), wireless internet, 3 LCD TV's, 5-zone stereo system, private balcony with excellent gulf views, a filtration system for drinking water and free long distance.Please be aware our area is developing rapidly, and there is construction in the immediate vicinity. Ground Level/Outside: Private, shuttered porch which opens onto the pool and adjacent outdoor shower. A built-in gas grill, complete with wash basin, is located inside the porch for cooking and eating at the teak dining table that seats 8. Enjoy the gentle breeze of the ceiling fans while reading a book or taking a nap on the hanging day bed lounger. This is a great area for entertaining. Pool side there is a wrought iron table and chairs as well as some loungers and adirondacks. Please note that the pool heater at 2 Days at the Beach is an electric heater which is most effective when day time temperatures are over 50 degrees. Second Floor: The house entrance is on the second floor. The king master bedroom has an LCD TV, built-in drawers, closet, 2 bedside tables with lamps and a private bath with pebble-tiled walk-in shower with oversized rainfall showerhead with separate hand wash and a granite sink vanity. In the hall just outside the master bedroom, is an alcove with a trundle bed (2 twins), and TV / DVD – a curtain can be drawn for privacy. The laundry room in the hall has a stackable washer / dryer. Third Floor: Ascend the stairs to the top floor to enjoy sweeping views of the gulf. This is the main living area with kitchen and a walkout balcony overlooking the pool and the gulf. Relax on tall cocktail chairs on the balcony with a morning cup of coffee or an evening drink watching the sunset. The kitchen has granite countertops, stainless appliances, including a microwave, glass top range, fridge with icemaker and dishwasher. Breakfast bar has 2 bar stools. The living space is complete with sofa, dining table with 4 chairs, an LCD TV with surround sound, Blu-ray player, a docking station for your iPOD and a five-zone stereo system for listening throughout the inside and outside of the house. Owner provides a movie library as well. Full bathroom on this floor has a walk-in shower and vanity sink. Make 2 Days at the Beach your cozy and economical location for your special vacation get away! IMPORTANT NOTE: Regarding pricing, a cleaning and processing fee, a $69 Vacation Rental Damage Plan Fee and tax will be added to ALL rates. Travel Insurance and pool heating (where available) are optional and can be added at Guest's choosing.